Our family had lots of celebrating to do this past weekend. 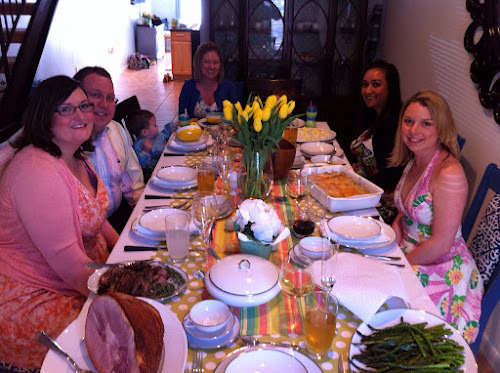 Josh's birthday, Passover and Easter. James and I kicked off the festivities by having lunch with friends at Nordstroms. The cafe is located next to the children's section so obviously it made the perfect venue, and the asparagus shrimp risotto is just about my favorite dish from any restaurant, anywhere. Lunch was fantastic, but the company made it even better. Then off to see the Easter Bunny. I didn't realize how pricy it was, and will most likely do a private session with real bunnies next year-way more fun and probably the same cost-ha! 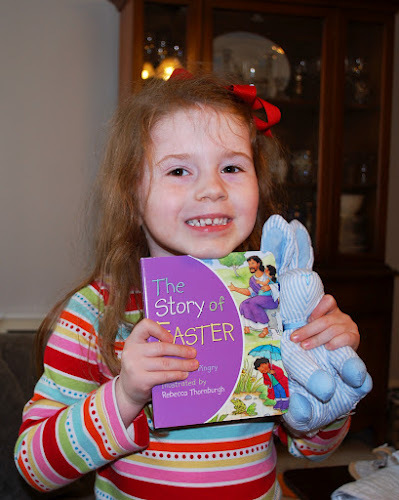 We have also been reading the story of Easter my aunt Tish sent, which happened to arrive the same day her doll babies were visiting us! I apparently can't comprehend my Jewish holiday google calendar or google search results of when does Passover 2012 begin, my well laid plans of an unleavened bread diet and kick off sedar dinner were a day late. As I thought the Passover began on Saturday. Needless to say, when Josh got home from work on friday and asked where's the beef (brisket), I hadnt made it. We were fine as Josh bought the huge family case of matzo, and whatever I had actually made for dinner seemed to work. Our sedar dinner coensided with Josh's birthday. And he had a pecs ah birthday cake. He has been shorted birthday cake the majority of his life. I let him pick from the chocolate, fudge and strawberry offerings. He picked fudge (the one on the left). 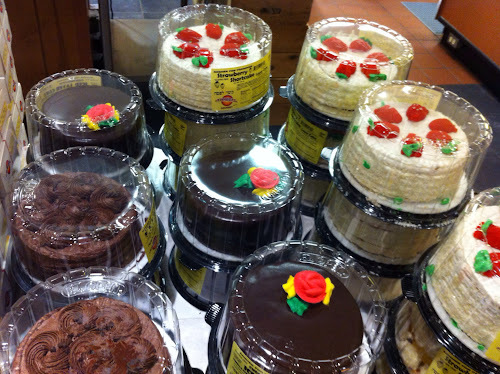 I love text messaging pictures from the grocery store. We had our traditional brisket and roasted vegetables for sedar dinner (a day late). 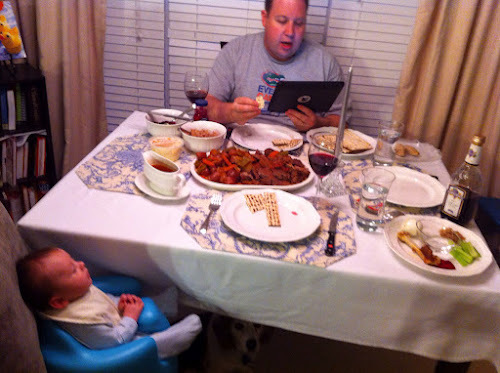 I loved that Josh found a haggadah app and read it from his iPad...so 2012. 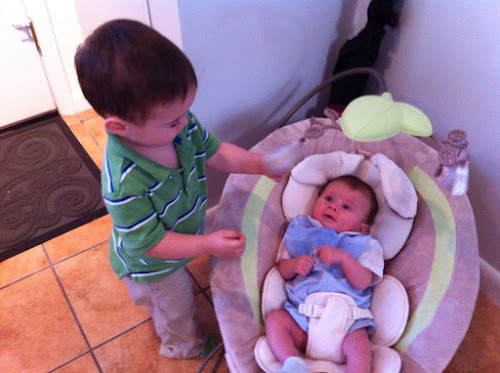 James sat in his bumbo seat to mark the occasion. We didn't go all out this year, and opted to be more casual. Daddy got a fancy new suitcase and nice golfing polo for his birthday. Although we would like him not to jet set all over the world and stay home with us. He did forgo playing on a nice private executive course last week after work to be with us, so he got a new shirt for his next tee time. On Easter, I fell back asleep after our 7:30 nursing and woke back up 30 minutes before church started. Not enough time to get us all ready and out the door. 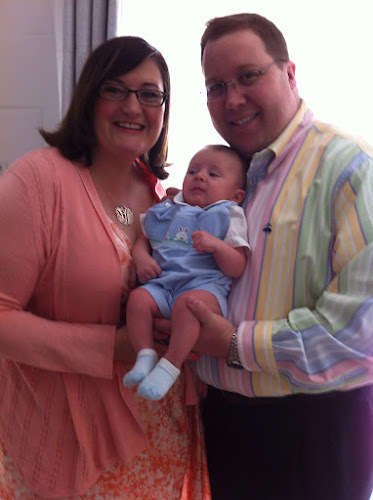 So James' first church service has been delayed a week or so. 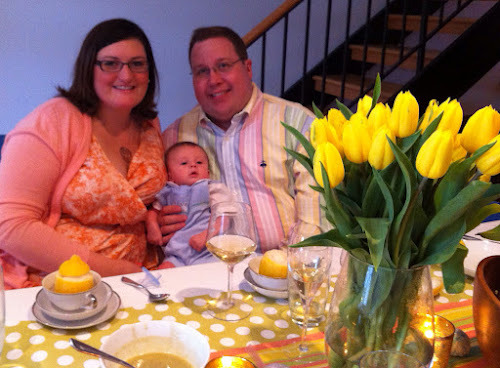 We did however make it up to Baltimore for a late afternoon Easter dinner, hosted by Michael and Lacey. It was so good, Lacey always sets a beautiful table, but even more beautiful are the people who sit around it. We had deviled eggs, a beautiful salmon dip, grilled lamb, honey baked ham, scalloped potatoes, roasted asparagus with hollandaise sauce, ambrosia, strawberry salad and lets not forget sister seuberts rolls. 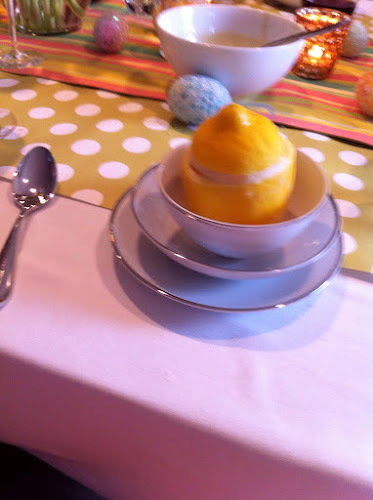 The lemon sorbet and miscotto were a perfect dessert and sweet ending to a wonderful day. Everything looks so perfect! 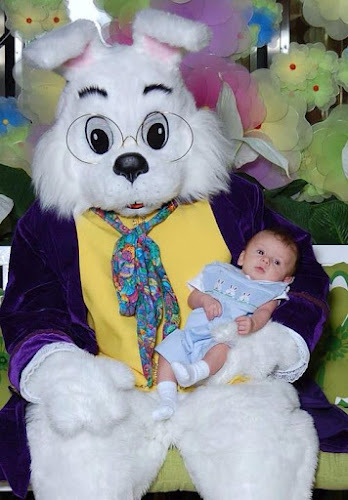 I love your baby's Easter outfit, too! WOW! Looks like your friend really outdid herself on Easter lunch! From the table setting to the dessert. 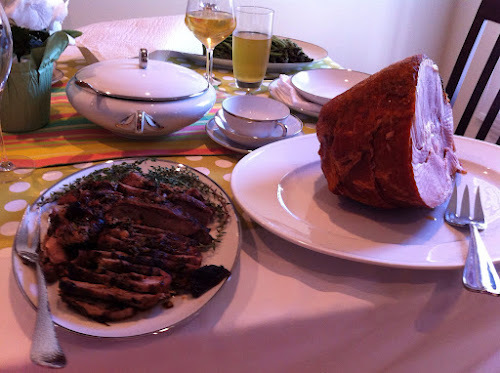 We had HoneyBaked Ham too. Delish. So, question. Are you guys Jewish? I guess I've missed that in the past? Looks like a wonderful celebration weekend. Your little man is such a cutie. We Passed with Flying Colors!